A FINE ROMANCE, the glass charm Susan designed to represent the dream-come-true she celebrated in her newest book (“A Fine Romance”), has arrived! Its green, like the country backroads of England. If you look at it closely you can almost see Susan’s car winding through the hedgerows (on the wrong side of the road!). Engraved with hearts, A FINE ROMANCE, plus Susan’s initials, and hallmarked with 925 on the silver core (925 is the international code for sterling), Susan’s Dream Charms are handmade glass beads crafted by studio artisans in the style originally developed in Murano, Italy. They will fit on any of the popular charm bracelets, on a ribbon, or a chain around your neck. 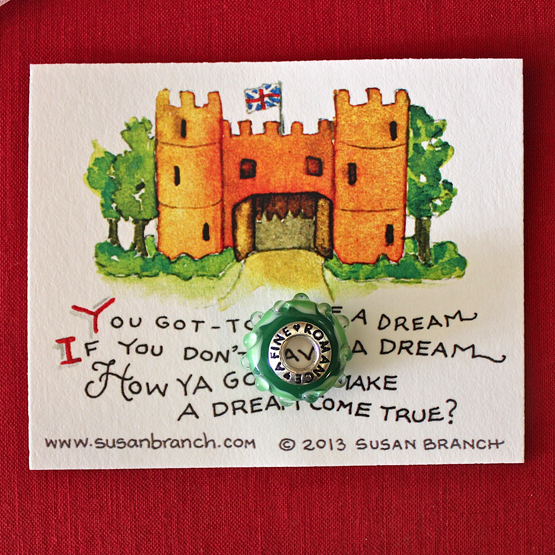 Each charm comes on it’s own Susan-designed gift card. Limited supplies, only available at our web store, and only $34 each.